Bhavesh Patel considers the recent ‘warning’ given by the Care Quality Commission to Brighton and Sussex University Hospitals NHS Trust. I have been reading in the news about the warning notice that has been given by the Care Quality Commission (CQC) to Brighton and Sussex University Hospitals NHS Trust and, it is concerning to read about the variety of problem areas in patient care that have been identified as requiring improvement. This Trust is responsible for a number of hospitals, including Royal Sussex County Hospital, Brighton, and the Princess Royal Hospital, Haywards Heath – and it was these two hospitals which were inspected by the CQC prior to the warning being given. As an independent regulator for health and social care in England, the CQC is responsible for ensuring that the fundamental standards of quality and safety are adhered too. The Trust’s systems to assess, monitor, and mitigate risks to people receiving care and treatment as inpatients and outpatients were not operating effectively. Patients were being put at unnecessary risk because they were not being dealt with properly or in appropriate areas. There were ineffective systems to ensure the care, privacy and dignity of people attending both hospitals as inpatients and outpatients. The Trust had been failing to ensure patients are seen in line with national timescales for diagnosis and treatment. In many services, too many patients were on waiting lists which failed to meet national standards. What will happen next for this NHS Trust? Monitoring of the Trust is continuing over the next few months and a further inspection by the CQC will reveal what improvements have been made and what steps still need to be taken to ensure patient safety. A full report is then due to be published in August 2016. But is a further inspection enough to stop the re-occurrence of similar problems? In April 2014, the Trust was named as the worst in England for the numbers of patients waiting more than 12 hours to be admitted to A&E. It seems that the Trust did not adequately act and address the issues and a further inspection in October 2015 identified that the safety and management of the Accident and Emergency ward at the Trust was “inadequate”. 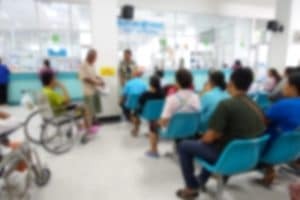 Although the CQC stated that management plans were in place, the Trust’s performance deteriorated over time and many patients continued to wait in A&E ward for hours, leading to delays and overcrowding. Although the continuous inspections identified the problems, when a Trust, as in this situation, has a re-occurring issue with no improvement, is a mere inspection and management plan sufficient? Whilst it is positive that the CQC report publicly reiterates the need for change, it is concerning that the same issues are re-occurring. Further, it seems to me that many of the issues are not always new information to Hospitals, but simply a further reminder of the need for improvement in patient care, which unfortunately is not being acted upon in a timely manner. It is therefore vital that problems that are identified are dealt with by healthcare providers as an urgent matter, which will hopefully reduce the devastating incidents that can occur due to delays in treatment in poor patient care. I hope that the Trust gets the support it needs to implement the changes and improvements that seem to be long overdue.